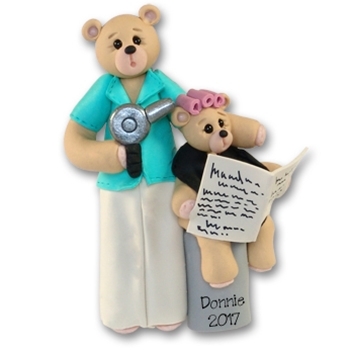 One of Deb's famous "Belly Bears" this Belly Bear Hairdresser personalized Christmas Ornament is chatting away while her customer is trying to read the paper. This is perfect for any one you owns a beauty shop or is a hairdresser. This ornament is extremely detailed right down to hair rollers and the newspaper. It is lovingly designed and handcrafted from polymer clay by Deb. Comes complete with a hook and satin ribbon for hanging. Measures approximately 3½" x 3½"